MARCH 8TH is a day attributed to the INTERNATIONAL WOMEN'S DAY. For some reason, the U.S. has stopped partipating in observing Women's Day with a long list of other countires far and wide. Each participating nation takes this day to acknowledge equal rights for women in their own ways. Above is a photo of Nepalise women dressed in their traditional garb to honor International Women's Day. 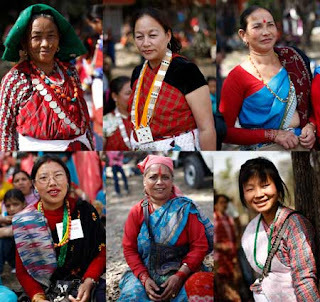 Nepal's theme this year is "Voice of Nepalis: Drafting Women-friendly Constitution." (Xinhua Photo) from China View.